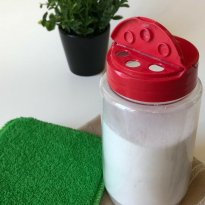 Before we talk about this week’s Tiny Tip, I want to first thank everyone who shared, pinned, and posted my tip on homemade cooking spray. I had no idea it would be such a huge hit! With over 20,000 pins (and counting) on Pinterest, this thing is spreading like wildfire! There are also a lot of comments with other tips and suggestions, so be sure to check them out too! 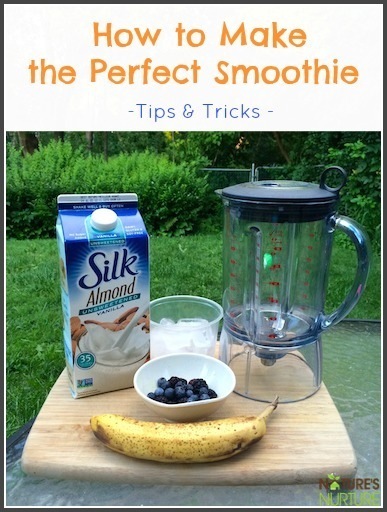 I would like to also personally thank Andrea from Frugally Sustainable for sharing it on her Facebook page. Please check out her pages – she truly is a wealth of information! Ok, now on to this week’s Tiny Tip! But this post isn’t about waffles. 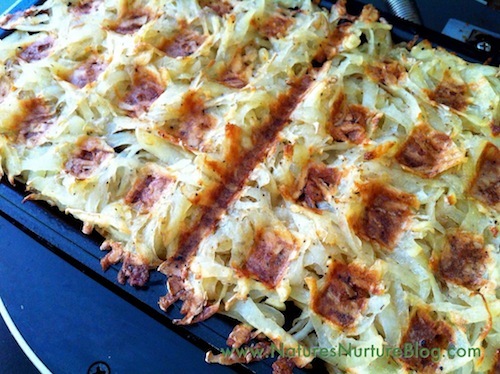 It’s about hashbrowns – in a waffle iron! Oh who am I kidding, I’m a lover of hashbrowns too. The crispy outside, chewy inside…even those cute little…a-ha! See what’s happening here? Who would have thought waffles and hashbrowns could be so similar? Not me. That is until I heard about this amazing idea on Pinterest a while back. I quickly brushed over it and didn’t think much of it. Then, I attempted to make hashbrowns for the first time in my life – and failed miserably! Side note: since completely eliminating non-stick cookware from my kitchen, and only using cast-iron and stainless steel pots and pans, my little escapades in the kitchen have been more, shall we say…teaching moments? Yes, teaching moments. And hashbrowns have taught me that you DO NOT turn your back on them for too long or they will grab hold of your precious pan and hang on for dear life! Yeah, we almost didn’t have hashbrowns that morning. I did, however, manage to salvage the layer of potatoes that wasn’t yet touching the pan, and that’s when I decided to go for round 2 in the waffle iron. I heated that baby up, sprayed some homemade cooking spray on it, and laid the potatoes right on the iron. About 15 minutes later, we had hashbrowns! It’s really the easiest thing, and works with any wafle iron – even my tiny little 2-waffle capacity iron. I actually got mine from my mom, since she wasn’t using it – thanks Mom! But you could even look for a second-hand iron at thrift stores, garage sales, etc. In looking for a little inspiration for this post, I came across the coolest site! 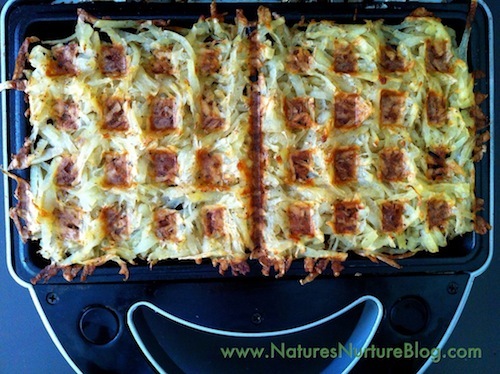 Waffleizer is an amazing blog that attempts to answer the question, “Will it waffle?” Basically, the author attempts different culinary experiments in his waffle iron – and with great success! Check out the site for more great ways to use your waffle iron; everything from quesadillas, to mac-n-cheese, to even cupcakes! Seriously, check it out. Now. You’ll thank me later. 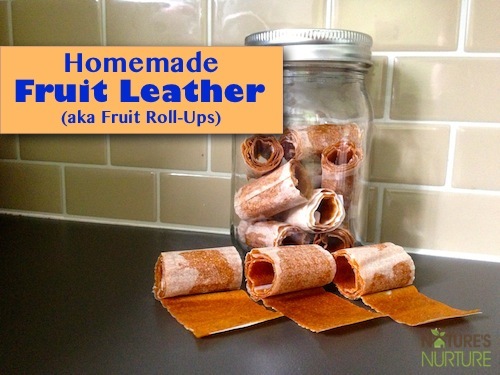 And it’s a great way to get more mileage from your waffle iron! Perfectly crispy outside, soft inside. Wash and shred the potato. Spray the pre-heated waffle iron with cooking spray, and layer the potatoes on the iron, about 1/4 inch thick. Close the lid and let them cook, checking on them after about 10-15 minutes. Over 9K pins, could not be wrong. This is a great share. Thank so much ! Awesome, thank you for your recipe. I’ve saved and will try it! 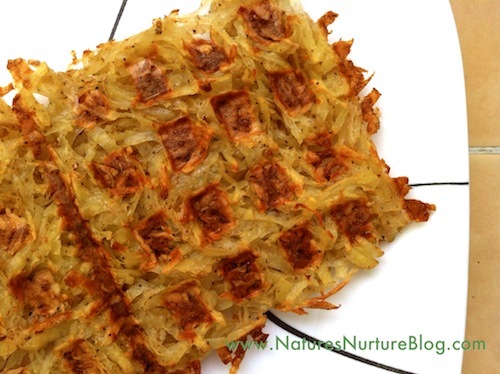 The hashbrowns are great done in a waffle iron, now try it with grated zucchini (don’t peel it, better for you), squash, sweet potatoes (takes longer to get crispy), and brownie mix, like a cookie (sprinkle with 10x sugar). My waffle iron is the only ‘pan’ I own that is non-stick. BTW I use the Homemade cooking spray too. Thanks for all the tips. 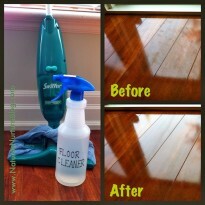 I’ve seen this before on Pinterest and wondered how well it worked. Thanks for the post. The secret to hashbrowns in a pan is two-fold. 1. cast iron frying pan. 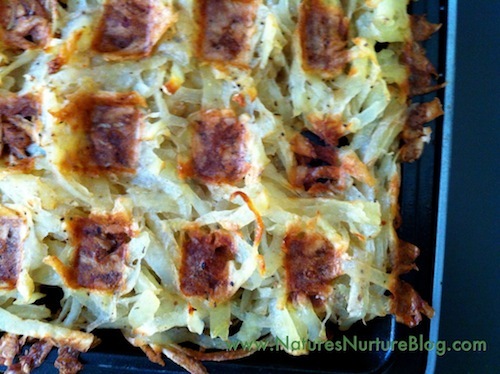 and 2, cook your hashbrowns until the first side is done, slide them out onto a plate, invert them onto another plate and then slide them back into the pan to finish cooking. 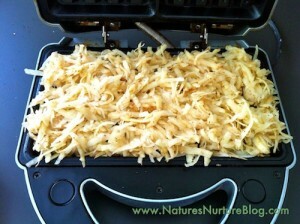 be sure to melt another 1/2 tblsp or so of butter in the pan before returning the hashbrowns to the pan. Thanks for the rip, Annie! This is a great idea. It took my iron 10-15 minutes to cook my hash browns. I will remember this! This is a great idea, I can’t believe I hadn’t thought of it before! My hash browns always stick ferociously. By the way, I usually use an oil with a little bit of liquid lecithin combination for my grease. Olive oil alone has never cut it for me. I keep it in a container and use a pastry brush to apply it. It’s really amazing, Hannah! And thanks for the lecithin tip – will definitely check it out! Made these tonight, yum! I brined thefirst batch & they were excellent. 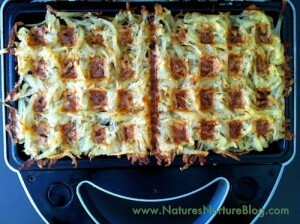 The second batch didn’t get brined & did not cook as well, stuck to thewaffle iron & did not get as crisp. I found your blog through this post – Boy am I glad I did! 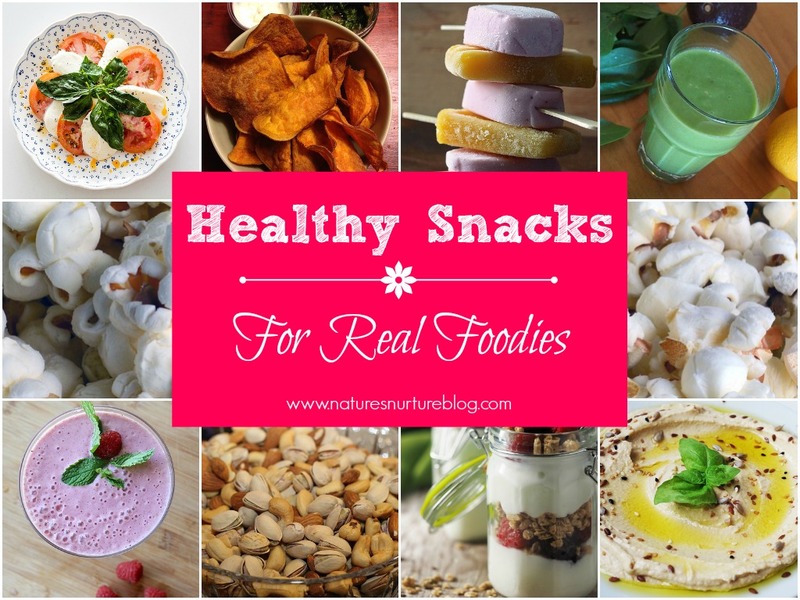 Great recipes and tips! thanks! now to RSS you so I don’t miss a thing! and check out the Waffleizer. YUM!!!! I Love hashbrowns! And I love playing with the waffle iron! I need to do this! I can’t wait to get a working waffle iron for this! 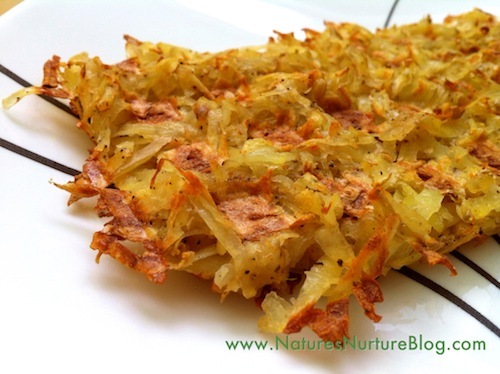 I can’t eat hashbrowns unless they are super crunchy but I’m a fellow no-nonsticker and incredibly impatient so I rarely bother with them in my house. I think you just ruined my diet! Sadly, my waffle iron broke this past weekend, so I’m also on a search for a new iron. 🙁 But believe me, you will LOVE these – they’re the crunchiest hashbrowns I’ve ever had! No way! I cant believe how crispy they get! my problem is, as you mentioned above, getting them truly crispy without burning them to a crisp. This is a fabulous idea and i WILL use it. Thanks! My husband is the resident hashbrown maker in our house. He insists that I am the pickiest hashbrown-lover, ever! I have to have my crispy, or I won’t touch them. Over 20,000 pins! Woohoo! That’s awesome. 🙂 These, look quite yummy. In fact, I’m going to pin them right now and will definitely give them a try! Very interesting! 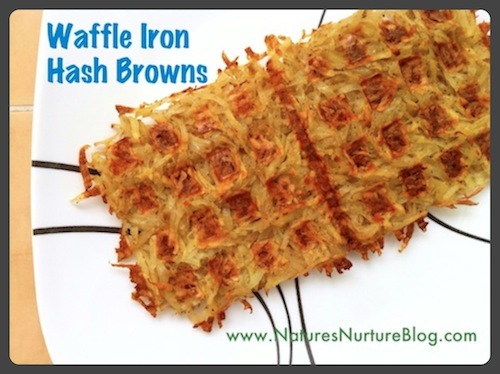 I’m really careful about what I put in my waffle iron for fear of messing up the tefflon…. but this looks to easy not to try! Any tips on how to shred the potato? I just used my regular grater/shredder and used the side with the largest holes. Worked perfectly. 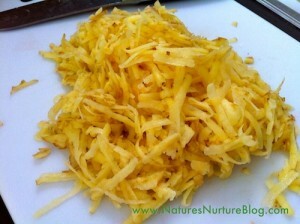 has anyone tried this with refrigerated, preshredded potatoes. “Simply Potatoes” makes them plain & sothwestern (has a little kick). Seems like if you dried potatoes & cooked a little longer, this would work. Let me know if anyone else tries this. 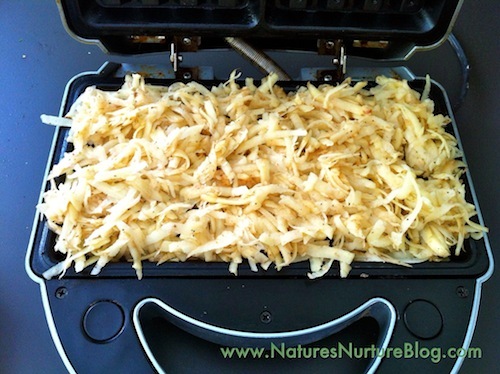 Wow, I love hashbrowns too, but they can be so messy with all the popping grease. I bet this way limits that AND it is healthier too. Love it! Waffles aren’t really that popular down here, I haven’t even seen a waffle iron for sale, so I might need to turn to le interwebz to import my own. I’m bringing waffles down under, baby! Forgot to rate the recipe! I rate it high because of less dishes for me & it’s crunchy! Pinned! Now why didn’t I ever do that? We love wattles here! Thanks!